“Is your phone glued to your hand?” As a teenager, this was a question that Amy Kim heard often. 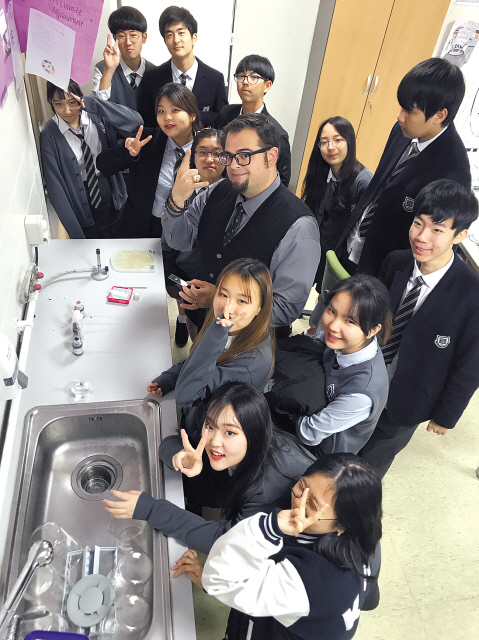 However, as president of the biology club at Korea International School (KIS) it raised a deeper concern: using a cellphone isn’t just a distraction to students, it can also be a very real health risk as well, due to microorganisms that can be transferred back and forth between students’ hands and their phones. In fact, according to scientists at the University of Arizona, cellphones can carry ten times more bacteria than toilet seats. These potentially dangerous bacteria and other microorganisms can be easily transferred to our body when we touch our faces, as well as when we eat, drink or talk on our cellphones. Having a longstanding interest in public health issues and being a regular fundraiser for Doctors Without Borders, Amy decided to use her position as biology club president to carry out an experiment to highlight how easily bacteria and other microorganisms can be spread, as well as to demonstrate to other KIS students the ways in which hygiene can be improved to prevent this. She cultivated bacterial samples taken from hands that had been cleaned in various ways, ranging from hands that had been quickly rinsed with water to hands that had been cleaned using medically approved hygiene techniques or alcohol-based sanitizers. The results clearly demonstrated that the way in which hands are washed is crucial: simply washing them with water, or even quickly using soap and water, was not effective; in order to effectively remove microorganisms, proper handwashing techniques are necessary. Armed with this evidence, Amy taught her classmates at KIS about the CDC recommended handwashing techniques and started a biology club campaign to promote regular handwashing. As the CDC themselves point out, “handwashing is a win for everyone, except the germs.” Realizing that the classroom provides the perfect environment for transferring microorganisms among pens, phones, textbooks, desks and chairs, and that soap and running water are not always available, she also led a biology club project to create an effective alcohol-based hand sanitizer and distribute it among students. For Amy this is only the first step. In between juggling a busy high school life and preparing for AP exams she hopes to lead a follow-up experiment to investigate which specific classroom objects harbor the most microorganisms, and potentially look at ways of making these items in particular cleaner as part of an ongoing campaign to improve the general health of KIS students. After graduating high school, she is considering studying a biology or medical science related degree and hopes to one day follow her parents into the field of medicine or public health.